"In Australia, our native vegetation is superbly adapted to surviving in arid environments and it consequently uses water very efficiently," Dr Donohue said. "Australian vegetation seems quite sensitive to CO2 fertilisation. This, along with the vast extents of arid landscapes, means Australia featured prominently in our results." "While a CO2 effect on foliage response has long been speculated, until now it has been difficult to demonstrate," according to Dr Donohue. "Our work was able to tease-out the CO2 fertilisation effect by using mathematical modelling together with satellite data adjusted to take out the observed effects of other influences such as precipitation, air temperature, the amount of light, and land-use changes." "On the face of it, elevated CO2 boosting the foliage in dry country is good news and could assist forestry and agriculture in such areas; however there will be secondary effects that are likely to influence water availability, the carbon cycle, fire regimes and biodiversity, for example," Dr Donohue said. "Ongoing research is required if we are to fully comprehend the potential extent and severity of such secondary effects." This study was published in the US Geophysical Research Letters journal and was funded by CSIRO's Sustainable Agriculture Flagship, Water for a Healthy Country Flagship, the Australian Research Council and Land & Water Australia. Using Advanced Very High Resolution Radiometer data spanning 1981–2006 and calibrated for long-term analyses of vegetation dynamics, we examine whether vegetation cover has increased across Australia and whether there has been a differential response of vegetation functional types in response to changes in climatic growing conditions. Trends in vegetation cover are interpreted within Budyko's energy – water limitation framework. Results from an Australia-wide analysis indicate that vegetation cover (as described by the fraction of Photosynthetically Active Radiation absorbed by vegetation; fPAR) has increased, on average, by 0.0007 per year – an increase of ∼8% over the 26 years. The majority of this change is due to a 0.0010 per year increase in persistent fPAR (representing nondeciduous perennial vegetation types; up 21%). In contrast, recurrent fPAR (representing deciduous, annual and ephemeral vegetation types) decreased, on average, by 0.0003 per year (down 7%), the trends of which are highly seasonal. Over the same period, Australian average annual precipitation increased by 1.3 mm yr−2 (up 7%). A site-based analysis using 90 long-term meteorological stations with minimal localized land-cover changes showed that energy-limited sites where total fPAR increased generally experienced decreases in precipitation, and water-limited sites that experienced decreases in cover were almost always associated with decreases in precipitation. Interestingly, where vegetation cover increased at water-limited sites, precipitation trends were variable indicating that this is not the only factor driving vegetation response. As Australia is a generally highly water-limited environment, these findings indicate that the effective availability of water to plants has increased on average over the study period. Results also show that persistent vegetation types have benefited more than recurrent types from recent changes in growing conditions. Regardless of what has been driving these changes, the overall response of vegetation over the past 2–3 decades has resulted in an observable greening of the driest inhabited continent on Earth. Today we released research which reduces the range of uncertainty in future global warming. It does not alter the fact we will never be certain about how, exactly, the climate will change. We always have to make decisions when there are uncertainties about the future: whether to take an umbrella when we go outside, how much to spend on insurance. International action on climate change is just one more decision that has to be made in an environment of uncertainty. The most recent assessment of climate change made by the Intergovernmental Panel on Climate Change in 2007 looked at what is known with high confidence about climate change, as well as uncertainties. It included projections of future global warming to the end of this century based on simulations from a group of complex climate models. These models included a range of uncertainties, coming from natural variability of the climate and the representation of important processes in the models. But the models did not consider uncertainty from interactions with the carbon cycle – the way carbon is absorbed and released by oceans, plant life and soil. In order to allow for these uncertainties, the likely range of temperature change was expanded. Our recent study has re-visited these results and tested an approach to reduce the range of uncertainty for future global warming. We wanted to calibrate the key climate and carbon cycle parameters in a simple climate model using historical data as a basis for future projections. We used observations of atmospheric carbon dioxide concentrations for the last 50 years to constrain the representation of the carbon cycle in the model. We also took the more common approach of using global atmospheric and ocean temperature variations to constrain the response of the climate system. We found that uncertainties in the carbon cycle are the second-largest contributor to the overall range of uncertainty in future global warming. The main contributor is climate sensitivity, a measure of how the climate responds to increases in greenhouse-gas concentrations. Climate sensitivity has been discussed recently on The Conversation. A recent study by Alexander Otto of Oxford University and colleagues, published in the journal Nature Geoscience, also considered future global warming in the context of observations of global mean temperature change over the last decade. Unlike that study, our results do not show lower climate sensitivity or lower mean projected global warming. Our study uses the same observed global atmospheric and ocean temperature data. But we also used observed carbon dioxide data and represented important additional processes in our simplified climate model, particularly the carbon cycle on the land and in the ocean and uncertainties in the climate forcing due to aerosols. In our study, the reductions in uncertainty came from using the observations, the relationships between them and how these affect the parameters in the simple climate model. We found 63% of the uncertainty in projected warming was due to single sources, such as climate sensitivity, the carbon cycle components and the cooling effect of aerosols, while 37% of uncertainty came from the combination of these sources. Once we reduced the uncertainty we found there is an increased risk of exceeding a lower temperature change threshold, but a reduced chance of exceeding a high threshold. That is, for business-as-usual emissions of greenhouse gases, exceeding 6°C global warming by 2100 is now unlikely, while exceeding 2°C is virtually certain. These results reconfirm the need for urgent and substantial reductions in greenhouse gas emissions if the world is to avoid exceeding the global warming target of 2°C. Keeping warming below 2°C is necessary to minimise dangerous climate change. 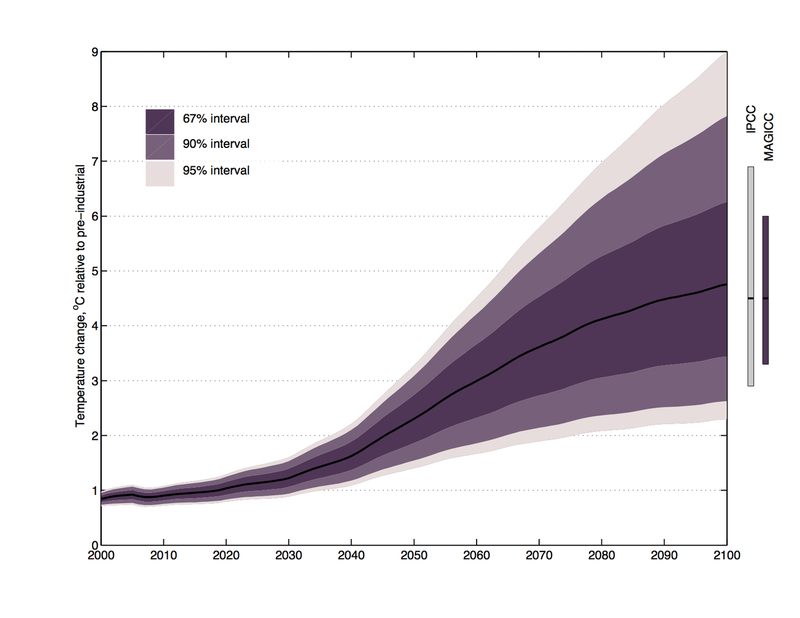 It is unlikely that uncertainties in projected warming will be reduced substantially. Indeed, if you allow for population growth, levels of economic activity, growth in demand for energy and the means of producing that energy, overall uncertainty increases. We just have to accept that we will have to manage the risks of global warming with the knowledge we have. We may not know exactly how much and by when average temperatures change, but we know they will. This is an experiment we probably don’t want to make with the only planet we have to live on. Roger Bodman received funding from the Australian Research Council while completing his PhD. David Karoly receives funding from the Australian Research Council and the Australian Antarctic Division. He is a Chief Investigator in the ARC Centre of Excellence for Climate System Science, a member of the Climate Change Authority and a member of the Science Advisory Panel to the Climate Commission. I've cleaned this blog out again. I'm going to be writing some more serious articles here about science and environment with a particular focus on Australia. That's a job for the first quarter in 2013. I now have a sister blog, blog.HotWhopper.com, which I started as a way of letting off steam about the appalling treatment I got from the operators and moderators at a large Australian share trading discussion board. I plan to develop that blog with articles about a variety of topics, including sexism and bullying, but with an emphasis on climate science denial - what motivates people to lie and deceive and discussing tactics of deniers etc. Meanwhile, I wish you all a very happy Christmas, Hanukkah or whatever you celebrate over the holiday season, and a healthy, happy and prosperous 2013. Victoria's high country is safe from cattle grazing in the national park. The Victorian Government says it is not ruling out a High Court challenge, but lets hope they don't waste their money. It's enough that they've reneged on other environmentally important issues, like restricting wind farms. After the cattle were kicked out last time around, the plants grew profusely. I've been visiting the high plains for forty years and, until a couple of years after the cattle had left, I had never in my life seen such a density of growth with so many different plants growing together. A proposal by the Victorian Government to reintroduce cattle to the National Heritage listed Alpine National Park in Victoria has been determined to be clearly unacceptable under national environmental law and will not proceed. Environment Minister Tony Burke said after careful consideration he had accepted the advice of the Environment Department that the proposal to reintroduce cattle to the Alpine National Park would have a clearly unacceptable impact on the national heritage values of the Australian Alps National Parks and Reserves National Heritage Place. In December, the Victorian Department of Sustainability and Environment submitted a proposal to the Federal Government for assessment under the Environment Protection and Biodiversity Conservation (EPBC) Act 1999 to reintroduce up to 400 cattle to graze in the state's Alpine National Park for up to five months a year for five years, as a research trial. Nine out of the 10 sites selected by the Victorian Government are partly or entirely located within the Australian Alps National Parks and Reserves which was included on the National Heritage List in 2008. The area contains a number of important ecological environments. Last year, the Federal Government made regulatory changes that formally recognise the significant impact of livestock grazing on the Australian Alps National Parks and Reserves National Heritage place under the EPBC Act. The regulation specifies that grazing of domestic stock including cattle could have a significant impact on the heritage values of the Australian Alps Heritage Area and that any future new grazing activities proposed in the Australian Alps Heritage Area, including the Alpine National Park, need to be assessed under the EPBC Act. "My decision is based on a thorough and rigorous assessment of the proposal, taking into account the advice of my department," Mr Burke said. "I have accepted the advice of my department that the proposed action of reintroducing up to 400 cattle would have a clearly unacceptable impact on the listed national heritage values of the Australian Alps National Parks and Reserves National Heritage Place. "The assessment has shown there is irrefutable evidence that cattle grazing would damage the sensitive natural environment, disturb the remote and wild character of the area, detract from aesthetic values, and erode its heritage values. "While my personal views on this matter are known, in determining this decision I have considered only whether or not the proposed action would be in breach of the EPBC Act. The Alpine National Park forms part of the Australian Alps National Parks and Reserves national heritage place that was listed on the National Heritage List to identify and protect the wide range of nationally significant natural and cultural values found within it. The parks and reserves extend over the Victorian, New South Wales and Australian Capital Territory borders and in total cover over 1.6 million hectares. They say the plan should be started afresh. Not throwing out all the work they've done - but they need to completely re-think what the plan is meant to be a plan of (water management, irrigation, environmental flows and so forth). It's not a plan yet and it won't do the job. This is the next episode in the ongoing sad saga of planning for the Murray Darling Basin. Previously - Mike Taylor quit as Chair of the Murray Darling Basin Authority, saying the government set impossible expectations that could not be delivered and were not in accordance with the Water Act. He had just released the Guide to the proposed Basin Plan, flagging "a long-term average increase of 7,600 GL/y (would mean) the environmental targets are all met and all catchments improve from their existing status to good flow levels". The Minister then appointed former NSW Labor MP Craig Knowles as Chair. Shortly afterwards, Wentworth Group of Scientists who were consulting on the plan quit. They said the process itself was flawed and that a decision had already been made that the minimum flows required (4,000 GL/year) would not be met. Knowles released the draft Basin Plan last month, which only provides for environmental flows of 2,750 GL/year. 2011 - 2750 GL/year - less 2600 GL/year removed from groundwater. The draft Plan released for public comment by the Murray-Darling Basin Authority on the 28 November 2011 does not provide the most basic information required to allow anybody to make an informed decision on the future management of the water resources of the Basin. There is no information presented on the effectiveness of the Plan to cope with long dry periods such as that experienced throughout the Basin during most of the last decade, or deliver the volumes of water required keep the Murray mouth open as a functioning (Ramsar listed) estuary and export the 2,000,000 tonnes of salt accumulating in the river system each year. Details of their statement can be found here. We'll probably be into the next drought within the next year or two. What will happen then? I do hope it is not too late for the Coorong and the red gum plains along the Murray. Will USA wake up soon that climate change is already here? As wunderground's weather historian Christopher C. Burt documents in his latest blog post, the situation is similar across the rest of the state. Seventeen major cities in Texas recorded their hottest summer on record in 2011. Most of these stations had records extending back more than 100 years, and several of the records were smashed by an amazing 3.4°F--at Lubbock and at Wichita Falls. Neighboring states also experienced unprecedented heat, withOklahoma recording America's hottest month by any state in recorded history during July, and Shreveport, Louisiana breaking its record for hottest month by 3°F in August. Mr. Burt commented to me: " I do not believe I have ever seen a site with a long period of record, like Shreveport, where records go back to 1874, break its warmest single month on record by an astonishing 3°. This is unheard of. Usually when a site breaks its single month temperature record, we are talking about tenths of a degree, rarely a whole degree, let alone 3 degrees! Hard to believe, frankly." Texas has also had its worst fire season on record, with over 3.5 million acres burned this year, and it's driest 1-year period in recorded history. An extreme rainfall event unprecedented in recorded history has hit the Binghamton, New York area, where 7.49" fell yesterday. This is the second year in a row Binghamton has recorded a 1-in-100 year rain event; their previous all-time record was set last September, when 4.68" fell on Sep 30 - Oct. 1, 2010. Records go back to 1890 in the city. The skies have now cleared in Binghamton, with this morning's rain bringing the city's total rainfall for the 40-hour event to 9.02". However, another large region of rain lies just to the south in Pennsylvania, and all of the rivers in the surrounding region are in major or record flood. The Susquehanna River at Binghamton is at 25.18', its highest level since records began in 1847, and is expected to overtop the flood walls protecting the city this afternoon. In Hershey, Pennsylvania, Swatara Creek is 18' over flood stage, and more than 8' above its record flood crest. Widespread flash flooding is occurring across the entire area, and over 125,000 people have been evacuated from their homes. And read the comments here on ClimateProgress for more about what rainfall records are being broken around the world. Congratulations, John, on winning a Eureka prize. Well done and very well deserved. Send him your best wishes, everyone. HotWhopper is my active blog, mostly sniping at science denying websites. Sou from Bundangawoolarangeera blog is dormant. (Most of the articles have been retrieved from the archives, minus any comments - a work in progress.) HotWhopper main website has a lot of climate reference material and charts. Generated 13 kWh (4.3 kWh/kW panels). Mostly sunny. Highest day = 24 kWh; 8.0 kWh/kW panels. Lowest day = 0 kWh; 0.0 kWh/kW panels. Average daily (719 days) = 11.1 kWh; 3.7 kWh/kW panels. Solar panels 23 degree tilt, WNW facing. Some late afternoon shade from neighbour's trees in autumn and spring.